Less than 2.5g fat per pack. Over 30% protein. 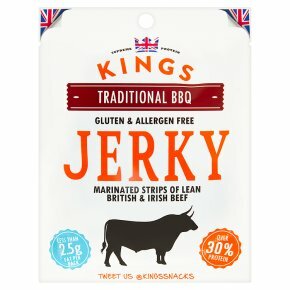 Kings beef jerky, made from marinated strips of British and Irish Beef. Gluten & allergen free. "A premium high protein British snack" Sliced from the finest, leanest cuts of British & Irish Beef, Kings Beef Jerky is the succulent high protein snacks sure to delight your taste buds!